Looking for the perfect boiled goose egg? Follow Adam’s recipe and you can’t go wrong. Peel each asparagus spear all the way down from under the tip, then bend and break the spear where it naturally cracks under resistance, about 4cm up from the base. Discard the ends or freeze for making soup at a later date. 1 Take a saucepan big enough to hold the egg at least four times over (to allow enough water to circulate) and line the bottom with a J-cloth. This will prevent the shell of the egg from cracking when it touches the bottom of the pan. 2 Fill the pan with water and bring to the boil. 3 Lower the egg into the boiling water and boil for 10 minutes exactly. This will give you a completely set white and a hot yolk, which is how I like my eggs, but it’s personal, I guess. 4 While the egg is boiling, cook the asparagus in a separate pan of boiling salted water for 3 minutes, then remove and drain. 5 Egg cups are simply not big enough for goose eggs, so you will need to improvise – I use a small bowl of sea salt as it provides a good solid base to stand the egg in. 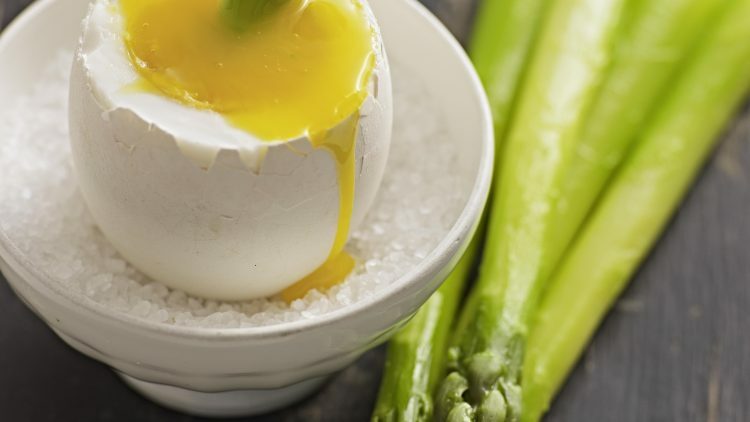 I have my seasoning to hand, and I place the asparagus spears next to the egg as an alternative to bread soldiers. The only question is which end to dip in first! If you are cooking more than 1 egg, the timing will be the same – as long as the pan is big enough for the water to circulate and the water is always boiling.